This is not the sort of warm reception you usually experience in a big city. 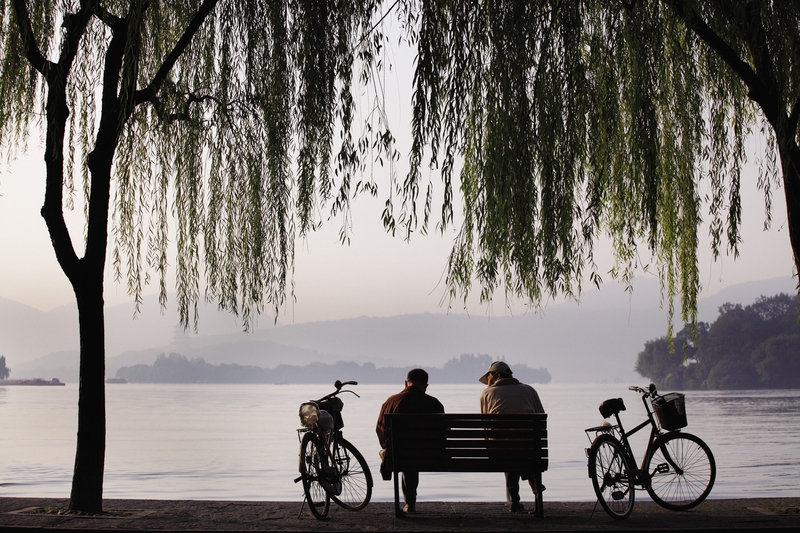 For despite the romantic reputation and poetry inspiring beauty of West Lake, the city attached to it has a population of eight million. Many of them can be seen whizzing about on red bicycles (Hangzhou’s equivalent of Boris bikes), paying little attention to traffic lanes or lights. But then as any Hangzhou native will tell you, this is the happiest city in China. Marco Polo described the metropolis, just south west of Shanghai in the Zjejiang province, as “the finest in the world” and the Chinese have a saying, “When you die there is heaven but when you live there is Hangzhou.” The beguiling West Lake with it’s dreamily named vantage points (Lotus in the Breeze Crooked Courtyard, Three Pools Mirroring the Moon, Orioles Singing in Ripples of Willows…) and surrounding, tea plantation filled countryside would certainly go a long way to upping the happiness quotient but so too does the food. Many of the dishes here, I soon learn, have romantic folklore stories explaining their origin often dating back to the Song Dynasty. Such as Dongpo pork – a braised pork dish named after the poet Su Dongpo who was a well loved governor of Hangzhou in the 11th century. 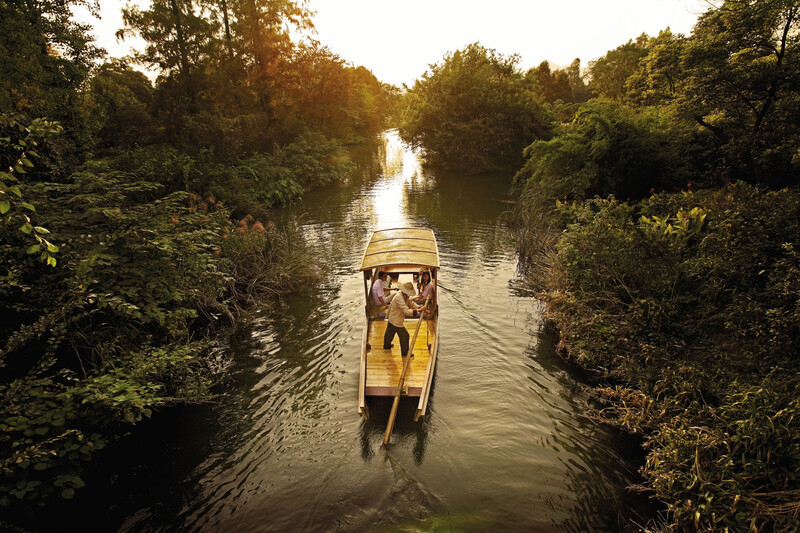 Hangzhou residents are rightly proud of their food. A phrase I hear over and over during my stay here – whatever the level of cooking – is “pure”. They like their food to be as fresh as possible and not messed about with too much in the cooking process so that the true flavours come through. When I get to Mu Gong Shan, a mountain village two hours drive north west of Hangzhou I can see why. In a pretty valley lies a small farming co operative. The land is lined with neat rows and the head farmer, Xu Haulong, leads the way through them, checking off the produce as we go. It’s an impressive bounty: peas, soy beans, sweet potatoes, tomatoes, garlic, chillies, celery, spinach, soy beans, and countless leafy greens which he says only have Chinese names. Cobbs of corn lie drying on the ground in circles. Geese glide on a small pond, ducks roam freely and pigs lie in a cool, dark shed to escape the midday heat. 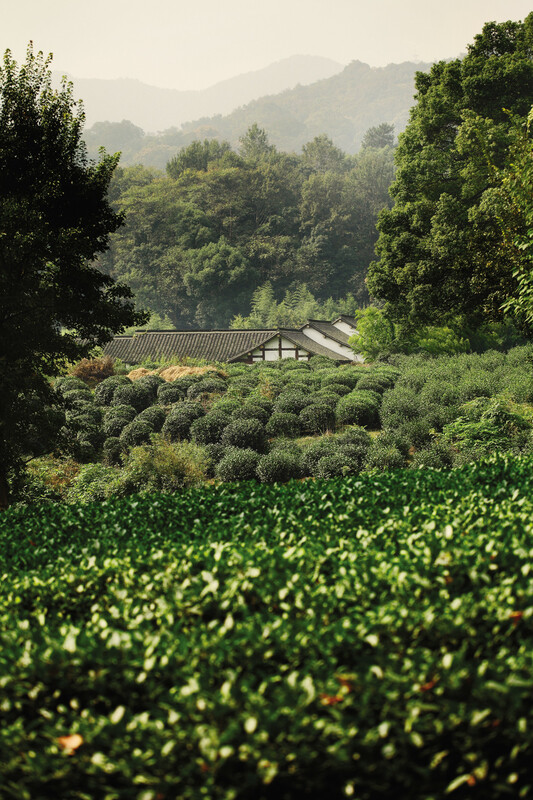 This bucolic place is where Dai Jianjun sources the produce for his renowned Dragon Well Manor restaurant on the outskirts of Hangzhou. Xu Hualong is one of Dai’s trusted suppliers and Dai is proud to show the farm to us to affirm how good his produce his. Dai picks up a large radish from the soil and peels it with a knife for us to eat; it has a startling fresh peppery taste. There are big, green torpedoes lying indiscriminately on the ground. “They’re Chinese watermelon. They can grow anywhere,” says Dai. He digs underneath a floppy leafed plant and unearths a sweet potato. “The leaves will be eaten by the pigs,” he says. Nothing is wasted here. If not food for the animals it will be turned into fertiliser or fuel. Plump, glossy feathered chickens have a bamboo house reached by a bridge which they happily scamper back and forth on to reach a shady wood. “There are no pesticides here so they are free to forage in the woodlands,” says Dai. 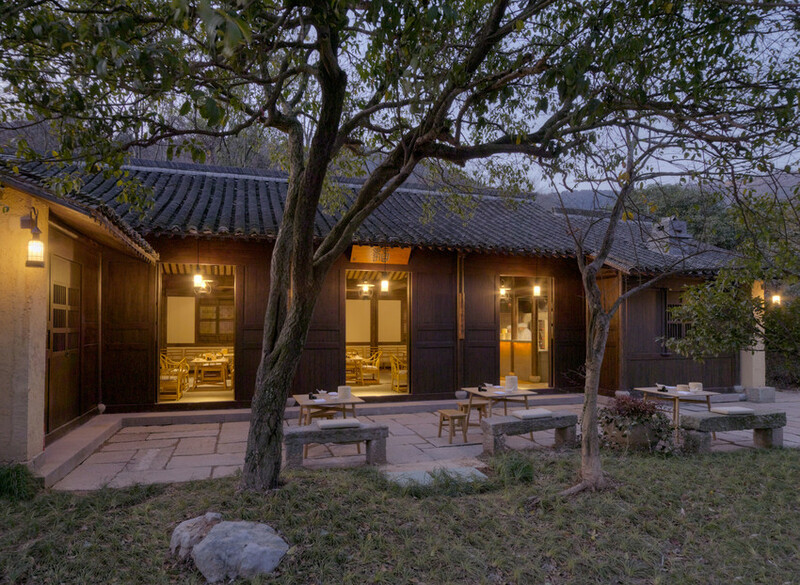 Dai’s restaurant, Dragon Well Manor, on the outskirts of Hangzhou in the middle of tea plantation country is a tranquil spot. 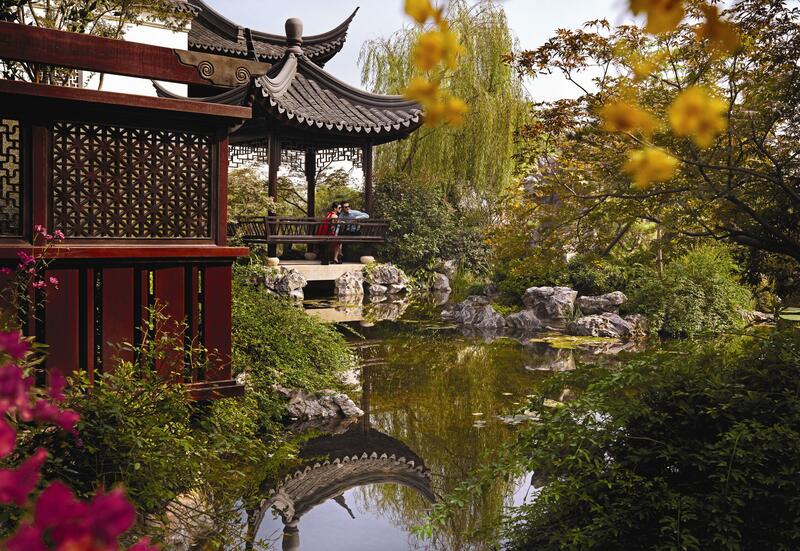 There are eight pavilions – each one a private dining room – dotted around ornate gardens with ponds and bridges. When we visit on a sunny late afternoon we can hear people chatting on their private terraces after lunch, no one in a rush to leave this lovely place. We pass two men en route to the kitchen carrying a crate of freshly caught fish. Just along the path another duo carry a basket of live ducks suspended from a bamboo pole on their shoulders. “The most significant thing is not the beautiful scenery, it’s the food,” Dai tells me over roasted nuts and Longjing tea. “The tea was picked from that mountain over there,” he waves casually. 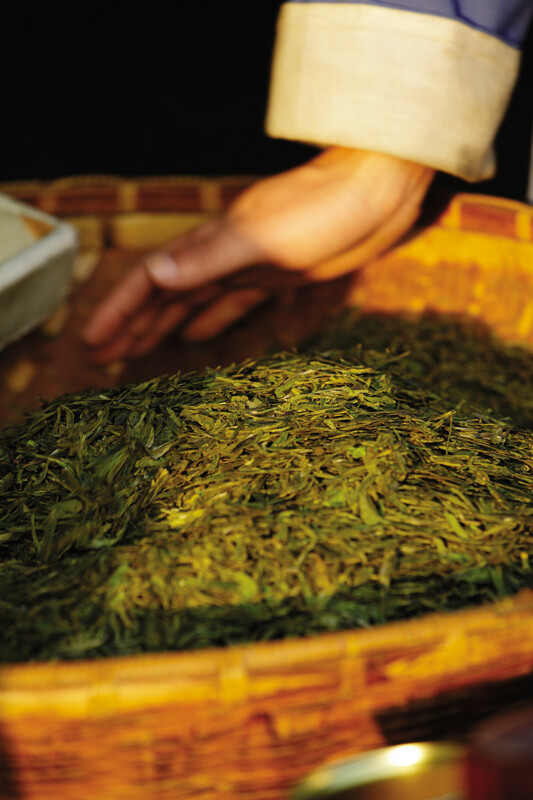 Longjing or Dragon Well tea is the most rarefied of green teas, grown locally – and the locals drink it constantly. It’s always served with the long, spear shaped leaves still in the cup (or more authentically, a tall glass). When the spears sink to the bottom you know the tea is ready to drink. “There is no menu,” Dai continues. “We prepare what we have. The customer tells us the price they want to pay and we build the menu around that.” Whatever your price point, this is not a place to come alone or as a couple. The private room set up and the banquet style menu means you need at least six people to do justice to the dining experience here. We start with bowls of warm, stone ground soy milk to which dried shrimp, spring onions and soy sauce are added. Then comes sliced cold beef, celery with pressed bean curd, a mix of wild mushrooms, the aforementioned ducks in a delicious broth. The dishes are coming out thick and fast: chicken with salted fish, pork belly with whole eggs in a rich sauce – a speciality that takes three days to prepare and then the star of the show: a fish soup. A waitress ladles out the soup each with a serving of perfectly poached carp. But on the side lies a discarded plate of fish and bones. Dai explains that fish had been used to create the tasty stock and then discarded. 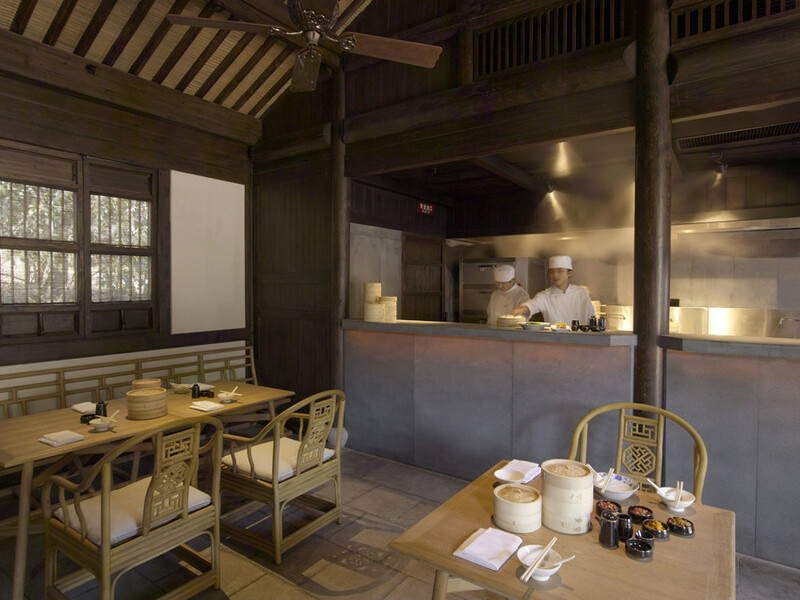 If there are only two of you then alas a visit to Dragon Well Manor is not feasible, but instead you can’t do better for simply prepared top notch Hangzhou food than the Steam House, also in the Longjing area. Set within an old Chinese village, now transformed in a unique hotel by the Aman group, the restaurant is housed in an old wooden building surrounded by pretty countryside as wild as Dragon Well Manor is decorative. 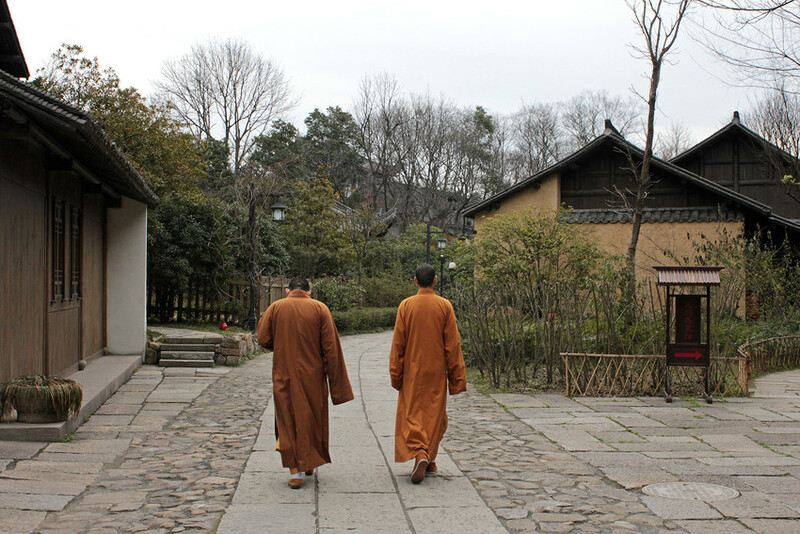 As the Steam House is on the main, cobble stone thoroughfare through the village you’re likely to see Buddhist monks en route to the temple. Everything on the menu is incredible from freshly made noodles to braised Chinese cabbage to stir fried crab. All produce is sourced from the surrounding countryside or Amanfayun’s own three kitchen gardens. Local herbs and flowers are put to good use too in the hotel’s bar (on an imaginative cocktail list) and spa where the treatments change according to the season. One of the advantages of staying not just dining here is access to this lovely spa. Like the rest of the resort, it’s been impressively designed to fit in with the original décor and the rambling countryside. Housed over several buildings, there’s a serene reflexology room above the reception area and a number of treatment rooms scattered around a gentle hillside. 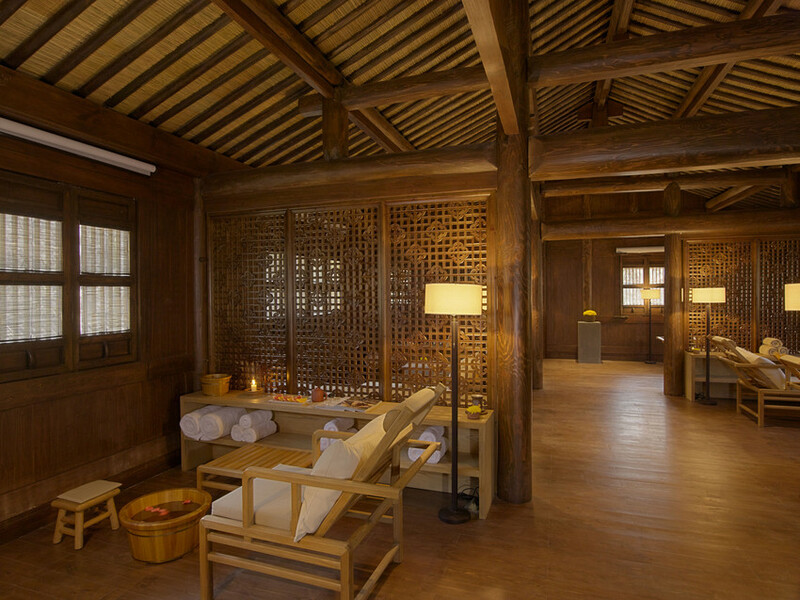 In spring the signature massage features green tea, using Longjing tea grown and harvested close to the hotel, which is thought to promote tranquility and in summer the treatment utilises fresh bamboo attributed with removing negative energy and relieving tension. Eating at luxury hotels is an easy option in Hangzhou. But don’t think of it as a cop out, the food is truly excellent. 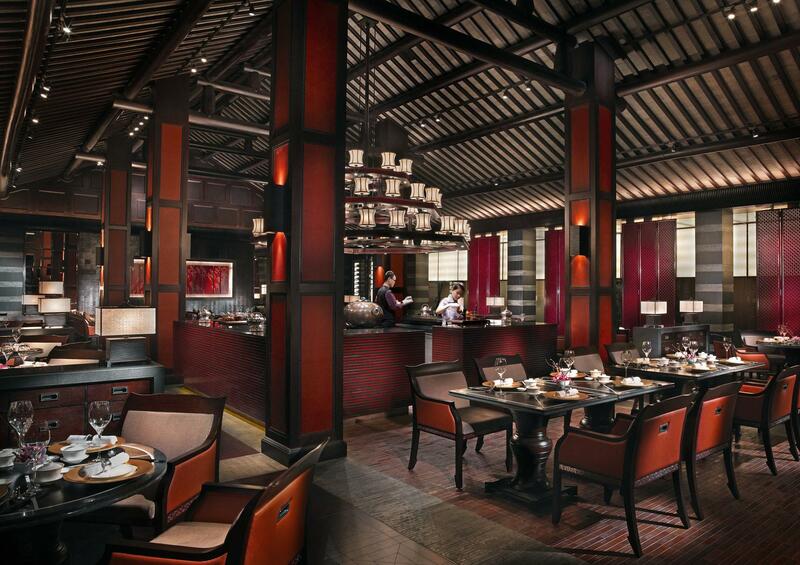 At restaurants such as 28 Hubin Road at the Grand Hyatt you are just as likely to see Chinese groups as Westerners. They come for two of Hangzhou’s signature dishes: Beggar’s Chicken and Dong Po pork. Both are delivered with a flourish. The story behind Beggar’s Chicken is that a starving beggar stole a chicken and while he was being chased, he buried it in the ground. When he returned later the chicken was encased in mud but he built a fire and cooked it nonetheless. These days the chicken comes stuffed with mushrooms and wrapped in lotus leaves before clay. It is so laborious to make that most restaurants need advanced warning to cook it for you. At 28 Hubin Road, the chicken is then carried, clay in tact, to your table and shattered before you, unleashing a wonderful aroma. 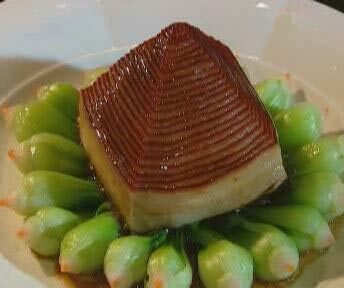 The Dongpo pork is even more impressive: braised pork belly is cut with a knife into one continuous strip and layered inside a pyramid mould then filled with bamboo shoots before steaming for a couple of hours. Chestnut pancakes are served on the side so you can construct your own delicious pork sandwich. At Jin Sha restaurant in the Four Seasons, the newest and the last hotel to be built alongside West Lake, chef Tan Chwee Chan creates superb, refined versions of Hangzhou dishes. 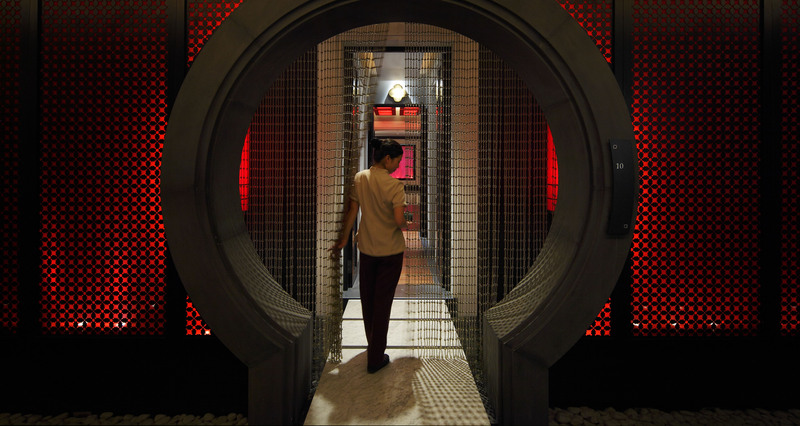 Hangzhou’s movers and shakers as well as a smattering of Chinese celebrities flock to the beautiful private dining rooms via a discreet entrance. There’s also a perfectly lovely main restaurant and it’s here that we taste the best example of Hangzhou favourites, Mandarin fish soup and Longjing shrimp. Tiny, sweet tasting shrimp stir fried in the famous green tea with a choice of soy sauce or vinegar to dip them into. After all that eating, a not too taxing meander around the Four Season’s ornamental gardens is called for. Or perhaps a treatment at the hotel’s impressive spa, designed in the same grand Imperial style as the grounds. 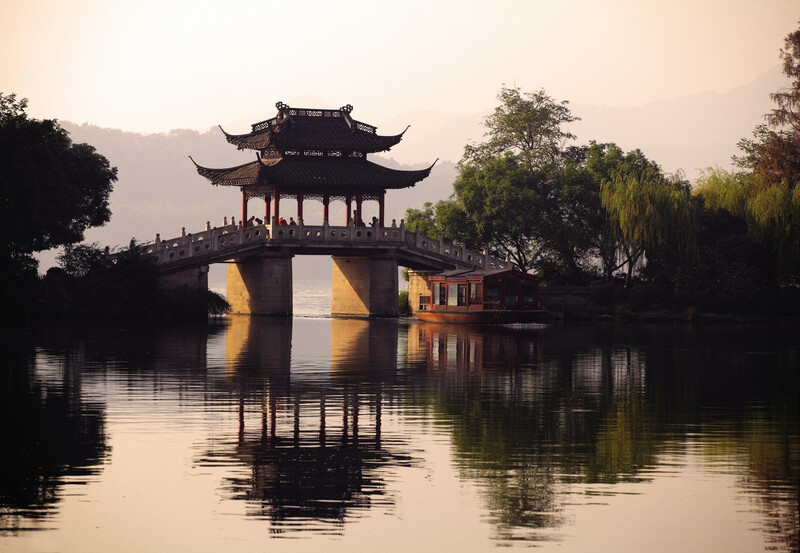 It’s enough to take you back to Hangzhou’s days of Emperors and Empresses.